The Mil Mi-38 is a transport helicopter designed by Mil Moscow Helicopter Plant. Originally intended as a replacement for the Mil Mi-8 and the Mi-17, it is being marketed in both military and civil versions. It flew for the first time on 22 December 2003. 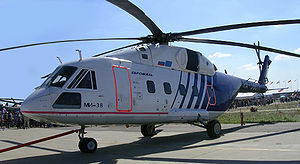 The manufacturer plans to provide the Mi-38 with a new Tranzas "glass cockpit" avionics system, modified main rotor blades. The helicopter is offered with a choice of either Klimov TV7-117V or Pratt & Whitney Canada PW127/TS tuboshaft engines. So far, only two airframes have been produced for testing, a third prototype is currently being assembled at the Kazan Helicopter Plant. The production is expected to begin in 2013. The second prototype, powered by the PW127TS, made its first flight in December 2010. Capacity: 32 passengers or 6,000 kg (13,200 lb) on internal/external hardpoints.